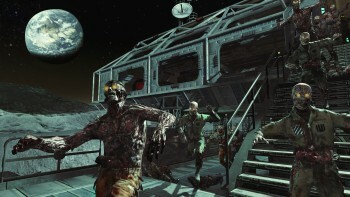 The Rezurrection DLC for Call of Duty: Black Ops is on the way and this time around it's all about the undead. It's all zombies, all the time in the upcoming Black Ops DLC release Rezurrection, but it's not just zombies, oh no - it's zombies on the moon! The new "Moon" level, described as "the climax of the Call of Duty Zombies saga," will feature new weapons, equipment and the shambling undead, all in a brand-new, low-G killing field. And that's not all! Rezurrection will also feature four remastered Zombie classics, "Nacht der Untoten," "Verruckt," "Shi No Numa" and "Der Riese," a Zombies Soundtrack with three brand-new tracks and a new Zombies Moon theme. And if you purchased the Hardened or Prestige Edition of Call of Duty: Black Ops, which already include the four Zombie levels, you can download the rest of the Rezurrection pack absolutely free. For everyone else, Call of Duty: Black Ops: Rezurrection will go for 1200 Microsoft Points and, in a pattern that should be familiar by now, will be available first to Xbox 360 owners, coming to Xbox Live on August 23. Release dates for the PC and PS3 have not yet been announced.